Gangster Squad gets points for style. It looks great in its depiction of postwar Los Angeles as a sleek, glamorous snake pit of crime and sin, never more so than when the camera lingers on Ryan Gosling’s Jerry Wooters, a cheerfully cynical, impeccably tailored lounge lizard of a police detective, a man who spends his off hours soaking up nightclub ambiance. Too bad that more thought went into costume design, art direction and recreating landmarks of the era than into Will Beall’s shallow and often ludicrous adaptation of Paul Lieberman’s “Tales from the Gangster Squad,” a 2008 Los Angeles Times true-crime series. At least Gangster Squad gets the players’ names right, but very little else, as it reduces an irresistible saga of crime and punishment to blood-spattered fantasy. By this film’s reckoning, World War II combat veterans have returned so damaged by their experience that – whether cop or criminal – they are good for little else than killing people (it is Josh Brolin as Gangster Squad head Sgt. John O’Mara who puts forth that absurd theory), corruption in Los Angeles is but a brief 1940s phenomenon (oh really? ), and gangster Mickey Cohen – the mob kingpin Sean Penn plays with such rage that he often appears to be close to stroking out – is so out of control that he is as apt to kill his own people as his enemies. It is also a movie that rewrites history purely to amp up the level of brutality. Working with a property set in a time period during which film noir flowered, an era that novelist James Ellroy has claimed as his own, director Ruben Fleischer has a strong grasp of the period. Again, this is a movie that looks good. Perhaps he hoped that with enough outsized violence and a stellar enough cast – that in addition to Gosling, Brolin and Penn, includes Emma Stone, Nick Nolte, Michael Pena, Robert Patrick, Giovanni Ribisi, and Anthony Mackie – he could muscle through the deficiencies in the script. No dice. 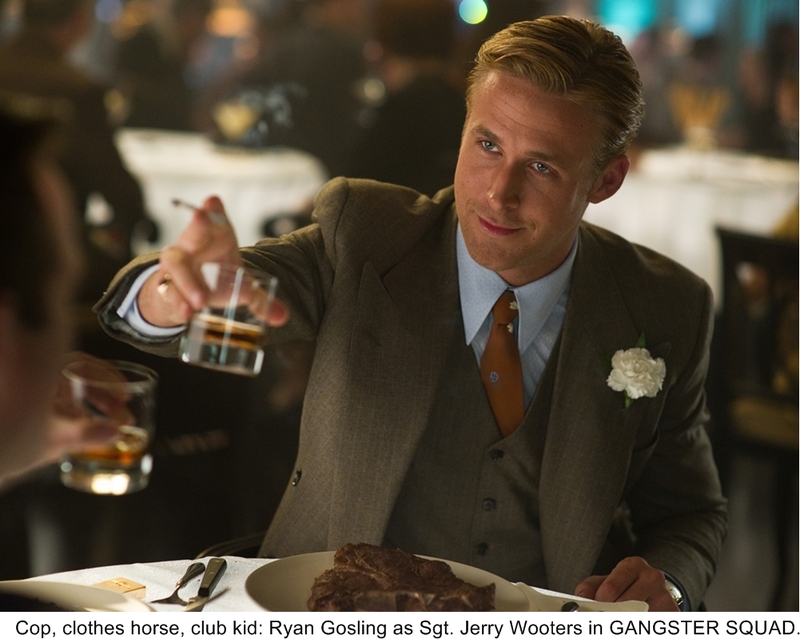 Like so many of the movie’s characters and nameless extras, Gangster Squad is dead on arrival, the victim of ludicrous plotting, rice-paper-thin characters and often pointless bloodshed.